Where I come from they say that summer begins on July 5th. This year we made it out relatively unscathed, and in my humble opinion, the forecast has been pretty wonderful (and hot) around here since early spring. Bring on the summer and all of it’s splendid heat! Since most don’t fuss with A/C on my side of the state, it’s always fun to see how creatively we can stay cool in our 1-2 weeks of hot, hot heat. As summertime is the foodie’s season; it is the BEST time to gorge on nature’s bounty. There are no limits when it comes to garden fresh veggies, herbs and fruit. There are so many amazing things one can do with the gifts of the summer season. 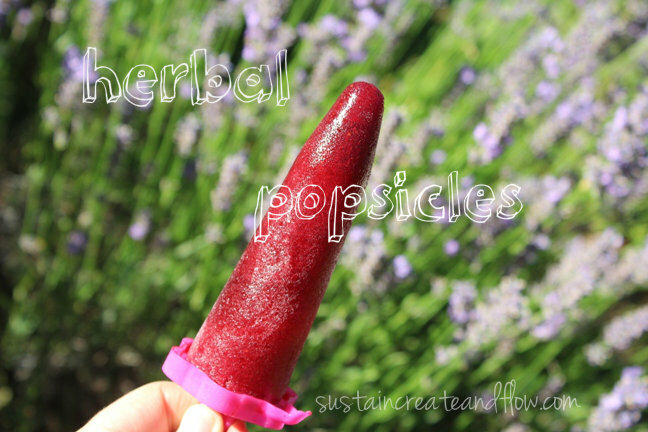 Food can be a great way to cool the body, and some of my favorite homemade summer treats include herbal sun tea, herb and fruit popsicles, sangria, and lots and lots of caprese salad! For those of you who do imbibe, you are probably familiar with how awesome alcohol is at NOT freezing. 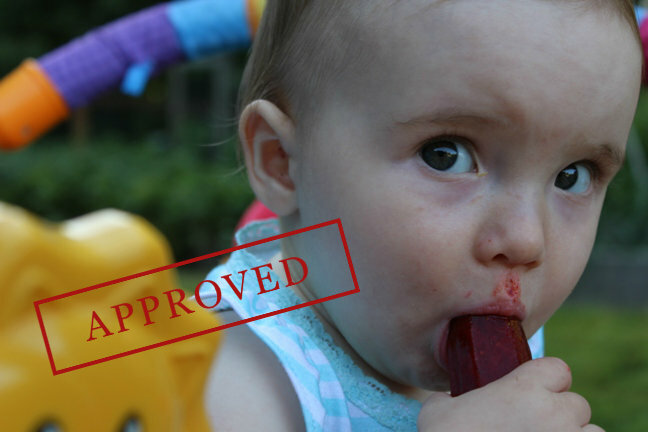 That is why a good rule of thumb is to use no more than 20% alcohol in your popsicle so you can get a nicely frozen treat. The addition of the alcohol adds a velvety element to the texture of the popsicle, which I think is dreamy on a hot summer’s day. I started with a big bowl of spent strawberries from the garden. 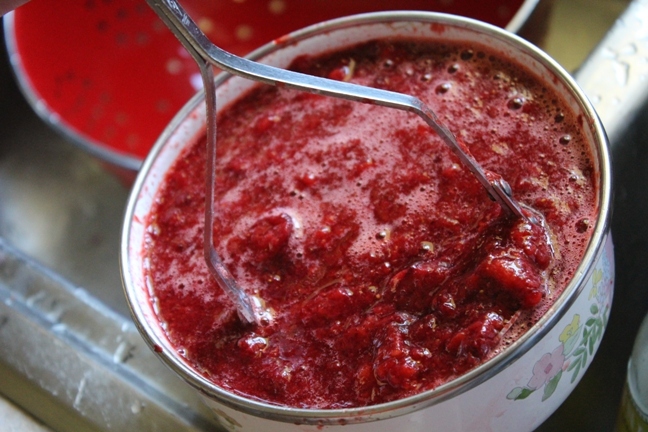 I mashed them them thoroughly until I had a bowl of pulpy strawberries and liquid. I pulsed the mixture until it was foamy. Probably not necessary; but fun. I just wanted the wine and fruit to be well incorporated. 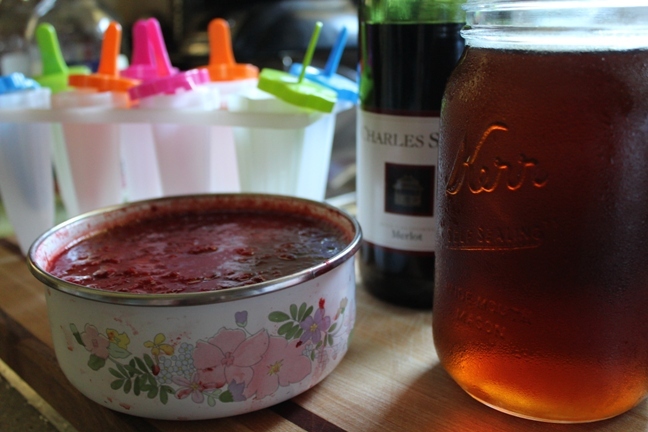 In popsicle molds , I filled them halfway with wine/strawberry mix, and the other half with my herbal sun tea. I made some with wine, berries and kombucha in lieu of the tea and they were phenomenal as well! My tea mix that day was lemon balm, bee balm, lavender, rosehip, raspberry leaf, and strawberry leaf thrown willy-nilly into a jar and solar-infused. *I always use dried herbs for my sun tea, because I find that the fresh herbs don’t infuse as well unless I add boiling water, which defeats the purpose of sun tea. I grew and dried all of the herbs, with the exception of the rosehip, which I bought at Mountain Rose Herbs. (A great source for dried herbs for tea and other medicinal purposes is Mountain Rose Herbs. High quality, wildcrafted, organic, and sustainable. Click Here to see what they have to offer). 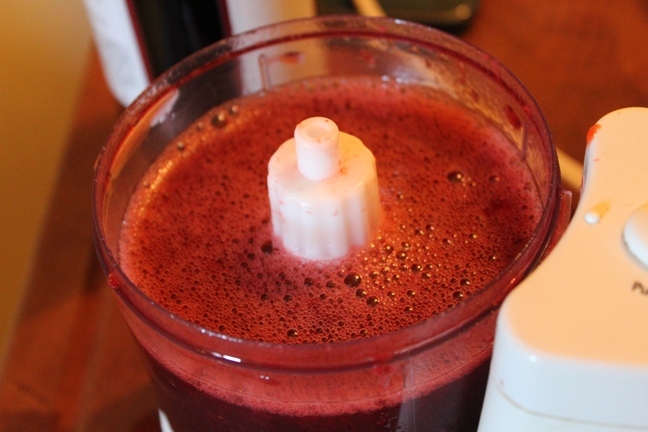 **If you are not using wine, just fill your popsicle mold halfway to 2/3 full with mashed/pulverized fruit and top off with your liquid of choice. (See above list). I love this idea! I always have Kombucha in the fridge because I make my own. Also grow my own herbs. Must try this soon! With wine of course!! I have been making watermelon popsicles. Now I will have to try these ideas. Just wish I could have seen the page easier instead of having a floating advertisement covering half the page. Sorry, Theresa. I meant to deactivate that part. I dont like it either. Thanks for the reminder! Thanks for the reminder. I’ve been meaning to change that. I don’t like it either!